Imagine getting the idea one day to sell everything you own, take the money to Las Vegas, and bet it all on a single spin of the roulette wheel. It sounds crazy. The risk of losing is very real, and you could very well be walking away with just the clothes on your back. 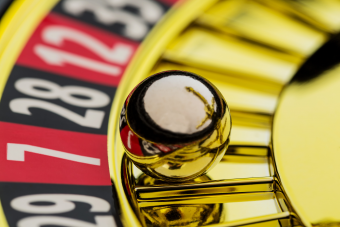 In fact, the chance of winning in an all-or-nothing red/black bet on an American roulette wheel is 47.3% (48.6% if playing on a European wheel). Ashley Revell of the United Kingdom decided to take that risk when he sold everything he owned and bet the resulting £76,840 (about £105,400 or $164,286 today) on red in Las Vegas during April of 2004. It should not be surprising that not everybody supported his plan, and both of his parents opposed the idea. Revell’s father, Mick, told his son that he was a “naught boy”, that he shouldn’t go through with it, and “He should work like all the other kids do.” Ashley spent time convincing them to support him in the endeavor. His father caved first, but his mother took a bit more persuasion before agreeing to support her son. Eventually a television crew from the British TV channel Sky One heard about his plan and created a TV mini-series titled Double or Nothing. Tallying it all up, after selling everything and acquiring funds from other sources such as being sponsored to change his name to “Ashley Blue Square Revell” by a UK online bookmaker, he managed to compile a very respectable total of £76,840. With the money in the bank ready to be wired over, he boarded a flight for Las Vegas with the camera crew, his friends, and parents in tow. He didn’t even technically have the clothes on his back at this point as what he was wearing was a tuxedo he rented specifically for the occasion. Plans to place the bet at the Hard Rock Hotel fell through after negotiations broke down with the casino. However, the owners of the Plaza Hotel and Casino seized the opportunity for publicity and agreed to host the roulette game, though directly before he placed his bet told him that they did not advise that anyone, including him, go through with something like this. With many family and friends there with him watching, along with the audience of Sky One‘s show back home, the ball circled the board before landing on a number- seven, a red color. Revell had doubled his money on one spin, giving him £153,680 (about £210,800 or $328,572 today). Unlike most who win big in gambling, Ashley decided that tempting fate once was enough for him. He declined to bet a second time and cashed in his chips at the table and walked away. One of the many viewers who watched Ashley Revell on the Sky One television program was Simon Cowell. Cowell was inspired by Revell’s all or nothing bet to create the television game show called Red or Black.